Every ASTM construction fastener specification possesses specific strength requirements. These tensile, yield, elongation, reduction of area, and hardness values are utilized by engineers to help determine the appropriate grade of bolt required for a specific application. Each specification possesses either a minimum strength requirement or strength range for some or all of these mechanical properties. Our Strength Requirements by Grade Chart is one of the most popular pages on our website with over 16,000 page views in 2018. This reference provides all mechanical requirements for 23 different fastener specifications. Until now, one of the challenges in using this chart has been the difficulty in comparing and contrasting grades that appear in different areas of the chart. The new feature we recently added allows the visitor to tick the boxes that appear to the left of the specifications to be compared and hit the “compare” button at the bottom of the screen. The Strength Requirements by Grade Chart removes all other information, leaving only the column headers and selected grades to be compared. The URL that is generated when the comparison feature is used can be bookmarked or copied and shared via email. Try it out! Did You Know? Portland Bolt Galvanizes! Hot-dip galvanizing is a process in which molten zinc is metallurgically bonded to steel to provide a corrosion-resistant coating. Only a couple of fastener manufacturers in the United States galvanize within the same facility as the bolts are made. Our galvanizing line is designed specifically for threaded fasteners and provides the highest quality finished product in the industry. 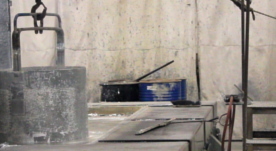 Advantages of galvanizing in-house include quality control and scheduling, in addition to lowering costs. A325 heavy hex structural bolts are perhaps the most commonly-used fasteners In the construction industry. The recent reclassification of the A325 specification has created some confusion within the construction industry. The new specification changes Grade A325 strength requirements in larger diameters, addresses extended thread lengths, and provides for various head styles. Under the new F3125 version of the A325 specification, the rotational capacity testing requirement for galvanized bolts has moved from a standard requirement to a supplementary requirement. However, the ASTM Fastener Committee F16 has recently introduced a proposal to make rotational capacity a mandatory requirement of the specification once again which may happen in the not too distant future. Starting in April of 2018, Portland Bolt began manufacturing the large galvanized F1554 Grade 55 anchor rods for the Long Range Discrimination Radar Equipment Shelter or LES at Clear Air Force Station in Alaska. The LES houses the Long Range Discrimination Radar (LRDR) that is designed to detect aircraft and intercontinental missiles that would be headed toward the United States. All told, Portland Bolt manufactured and supplied more than 83,000 pounds of domestically manufactured anchor rods, anchor sleeves, and accessories for this project.